Recently my husband and I embarked on our summer holiday tour of Northern Manitoba. While I had lived in Thompson, MB (on three separate occasions); my husband has never had the opportunity to explore the province we live in; our own back yard. Our intention was to mix in a little business and stop in at the communities along the way to say hi from APTN. You are probably wondering why I would share my holidays with you. Well, it is my hope that each of you will take the time to explore a bit of your own backyard this summer. Who knows what you will discover. We discovered places in Manitoba’s north that I had never seen, for no other reason except, that I was too busy driving to stop and “smell the roses”. Were we in for a treat! One such place was Little Limestone Lake! I had driven past the sign on the Highway 6 many times over my lifetime but had never taken the time to stop. Now I have never been to the Caribbean but I have seen pictures and when we caught our first glimpse of this lake I could swear I was in Jamaica! It was blue; blue like turquoise! It took our breath away! Little Limestone Lake is considered by experts to be the world’s largest and most outstanding example of a Marl Lake and it is managed by and situated within the Mosakahiken Cree Nation Resource Management Area. The water color changes from crystal clear to a striking opaque turquoise in the warm summer. We spent the day fishing for the elusive silver pickerel and jack fish and then we were off to Sasaqiu Rapids. Our trip started with a small agenda for the first week but we soon realized that it was becoming a tour of the Grassy River. Had we known, we would have planned to canoe the river instead of driving between our destinations. Our second campsite at Sasaqiu Rapids Lodge was only a 10 min. ride to Pisew Falls Provincial Park. It is there that the Grassy River drops almost 43 feet. We also discovered a new suspension bridge that crossed the river and took us to the top of the falls. The spruce, the rock, the stillness witness Mishipisew’s white anger – the winds dare not touch, ripple or stir the falling water. We spent four nights at Sasaqiu Rapids. While there we made a few trips into the Métis community of Waboden situated close to Setting Lake (part of the historic Grass River fur trade). As I mentioned before, I lived in this area a few times and heard stories about the community’s history on Setting Lake and about how they were relocated to their present location with the arrival of the railway. I have family from Waboden and have often fished off the “Sandy Beach” where the community once lived. There is still a cabin standing near that beach that was the original outpost/store and the community cemetery is just across the strait. This community is Métis dominant but many families originally came from the community of Cross Lake. There are still strong historic ties between the two communities. On a special note, we would like to give a big shout out to the Waboden Ice Cream Parlor for the amazing food and service. TWICE in fact! Best burgers north of Winnipeg hands down! Campsite number three found us at the stunningly beautiful Wekusko Falls Provincial Park where the Grass River again plunges 12 metres before flowing into Wekusko Lake. Historically, in the 1700’s this was part of the Upper Track fur trade route. The fishing was amazing and so was the campground. It was there that we found yet another suspension bridge at Wekusko; actually TWO! 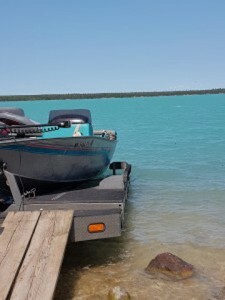 During our stay, we made a few trips into Snow Lake for supplies and to connect with the community. What a great town of great people! As much as we would have liked to spend more time at Wekusko, it was time to start our trek home. Campsite number four was just for a night at lodge in the community of Cranberry Portage. The people there were so friendly, but it was heartbreaking to see so many business closed. We enjoyed lunch at the Cranberry Portage Coffee Shop and while there we picked up a few more groceries. The coffee shop now sells groceries because the only grocery store in the community closed. While staying at Cranberry Portage we took a day trip to Bakers Narrows and Flin Flon. You know, I had NO CLUE that we had a lava flow in Manitoba! Yes, Flin Flon is built on a lava flow! For any rock nuts out there like me, this is the place to go! Next we were off, heading south to Duck Mountain Provincial Park to end our holidays with a one night stay at a cabin. We were in need of a real shower and a soft bed. It was perfect! So, stop and smell the roses in your own backyard. You will discover a wealth of things to do and see! We would love to hear about your holiday adventures. Please send in your story with pictures (I love pictures) and we will share them on facebook and twitter! FYI: By the time we arrived home, we had clocked 2335 kilometers!